Frank Duveneck (1848–1919), Brace's Rock (c 1916), oil on canvas, dimensions not known, Private collection. The Athenaeum. 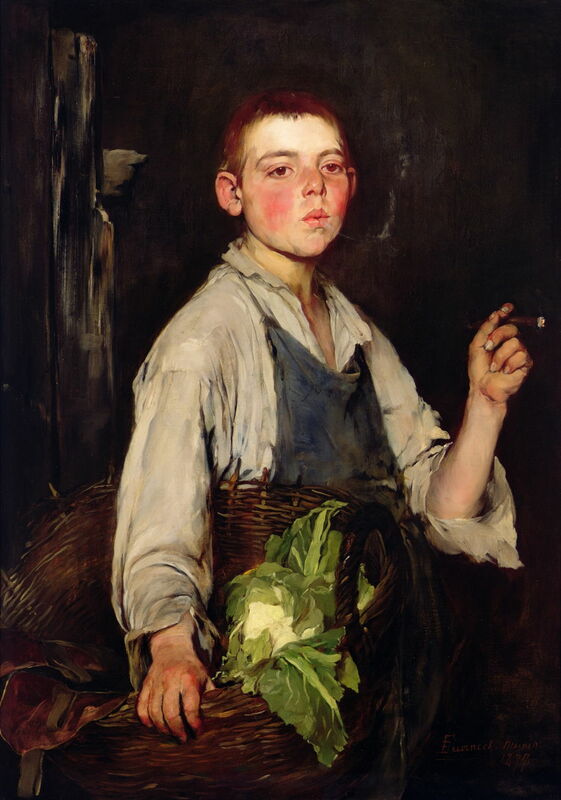 One name crops up time after time in the biographies of American painters who were active in the late 1800s, someone who seems always to have been there, in company with, but never to stand on his own: Frank Duveneck (1848–1919). It turns out that, at the time, he was as celebrated as his friends, such as William Merritt Chase, but now seems to have lapsed into the unknown. Frank Duveneck was born in Covington, Kentucky, to a German immigrant family, and was taught to paint by a local artist. In 1869, he travelled to Munich, Germany, where he studied at the Royal Academy under Wilhelm von Diez and Wilhelm Leibl. His paintings were acclaimed when shown at the Boston Art Club in 1875, and he found himself becoming a popular teacher. Frank Duveneck (1848–1919), The Turkish Page (1876), oil on canvas, 106.7 × 148 cm, Pennsylvania Academy of the Fine Arts, Philadelphia, PA. Wikimedia Commons. 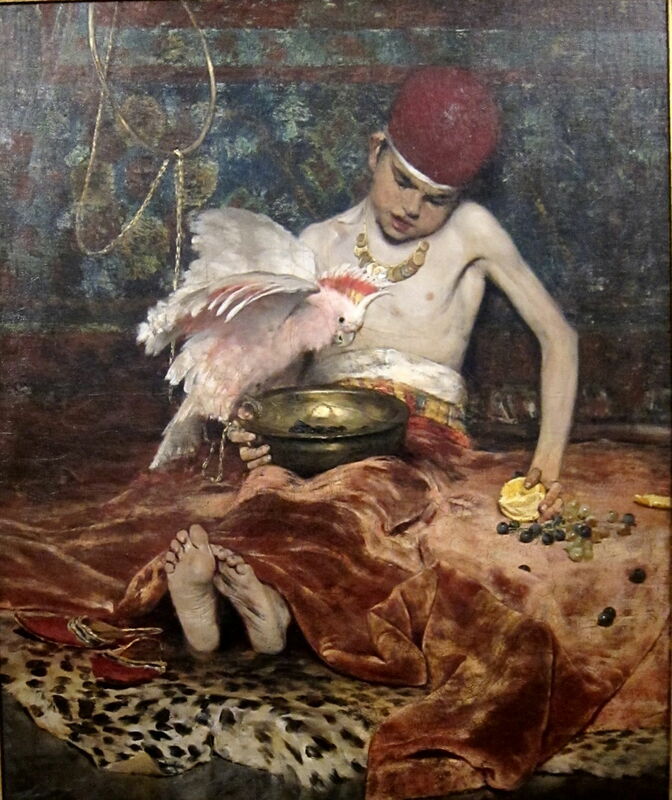 In 1876, Duveneck and Chase both painted a young boy, carefully posed with a parrot, in Chase’s Munich studio. Duveneck’s The Turkish Page is technically brilliant, and an exceedingly ambitious work for someone within seven years of starting their training. It was exhibited at the National Academy of Design in New York the following year, but had a mixed response. Viewers found its still life approach lost narrative, and were puzzled by the depiction of the child. By the time that it was displayed at the Pennsylvania Academy in its 1893-4 exhibition, changing taste brought it acclaim, and it sold. Chase’s version, below, was surprisingly different in many respects. I leave it to you to decide which you prefer. 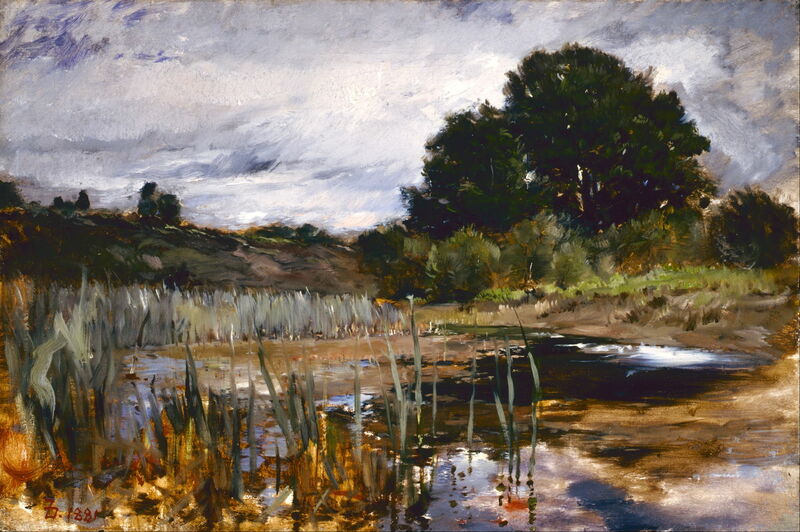 Either way, I think that it establishes Duveneck on a par with Chase in terms of art. Frank Duveneck (1848–1919), The Cobbler’s Apprentice (1877), oil on canvas, 100.3 × 70.8 cm, Taft Museum of Art, Cincinnati, OH. Wikimedia Commons. 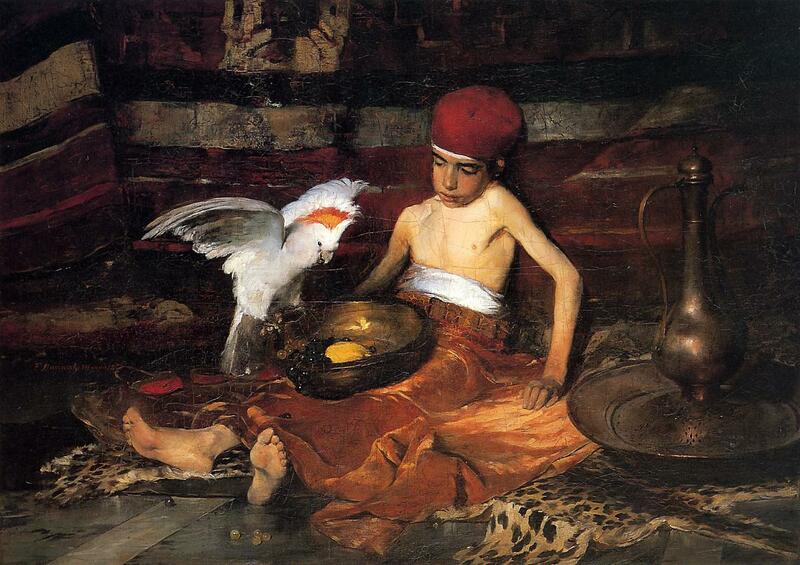 The Cobbler’s Apprentice (1877) was also painted in Munich, where it sold to the American Vice Consul. It eventually found its way into the collection of Charles Phelps Taft. Frank Duveneck (1848–1919), Still Life with Watermelon (1878), oil on canvas, dimensions not known, Cincinnati Art Museum, Cincinnati, OH. By Wmpearl, via Wikimedia Commons. 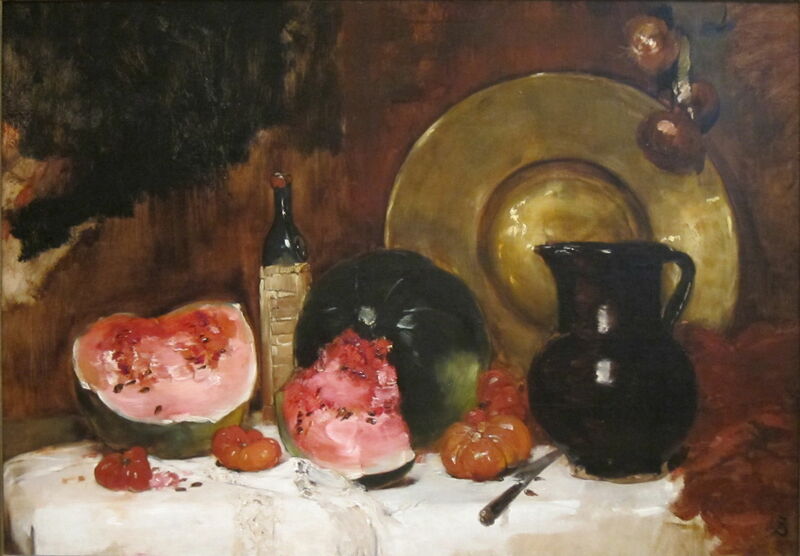 Soon, Duveneck’s style loosened, as shown in his very painterly Still Life with Watermelon (1878). Frank Duveneck (1848–1919), Polling Landscape (1881), oil on canvas, 40.6 × 61 cm, Indianapolis Museum of Art, Indianapolis, IN. Wikimedia Commons. During the late 1870s and 1880s, Duveneck spent long periods in Germany and Italy. In 1878 he set up his school in the village of Polling, in Bavaria, where he taught mainly Americans, who became known as the ‘Duveneck Boys’. These included John Henry Twachtman, Julius Rolshoven, and John White Alexander. Among the many wonderful landscapes which he painted there is his Polling Landscape (1881), which is one of my favourites. 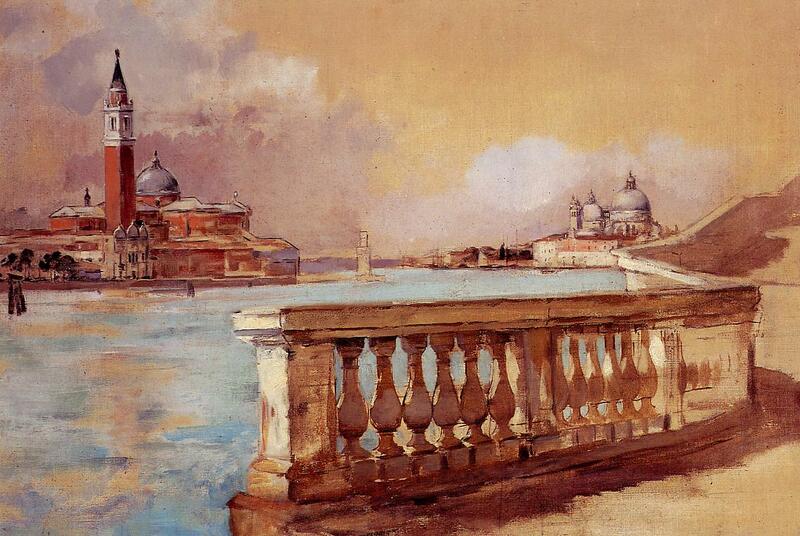 Frank Duveneck (1848–1919), Grand Canal in Venice (c 1883), oil on canvas, dimensions not known, Private collection. The Athenaeum. His Grand Canal in Venice (c 1883) was a study for his Water Carriers below, from his visits to Venice. Frank Duveneck (1848–1919), The Bridge of Sighs (1883), engraving, 27.9 x 21.6 cm, Private collection. The Athenaeum. 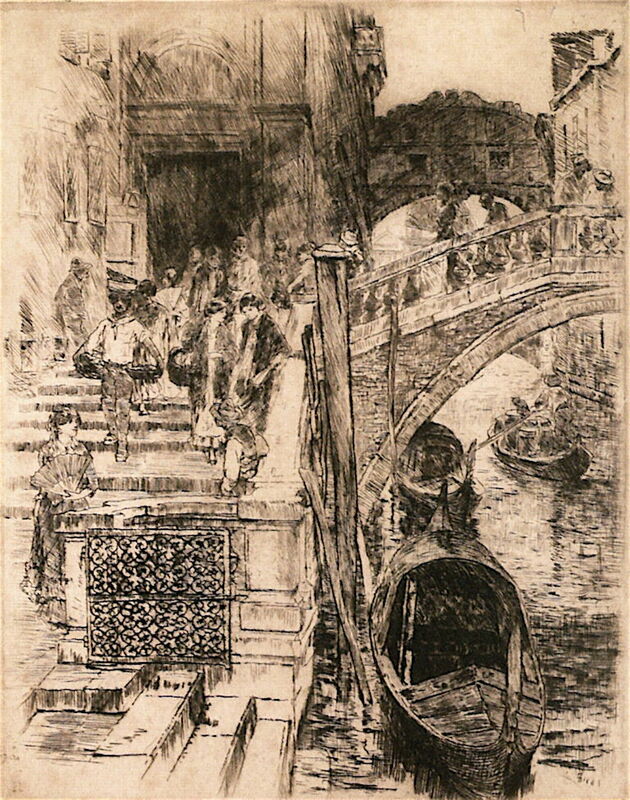 Duveneck was also a successful print-maker, as exemplified in his The Bridge of Sighs (1883). Frank Duveneck (1848–1919), Water Carriers, Venice (1884), oil on canvas, 122.9 × 185.8 cm, Smithsonian American Art Museum, Washington, DC. Wikimedia Commons. 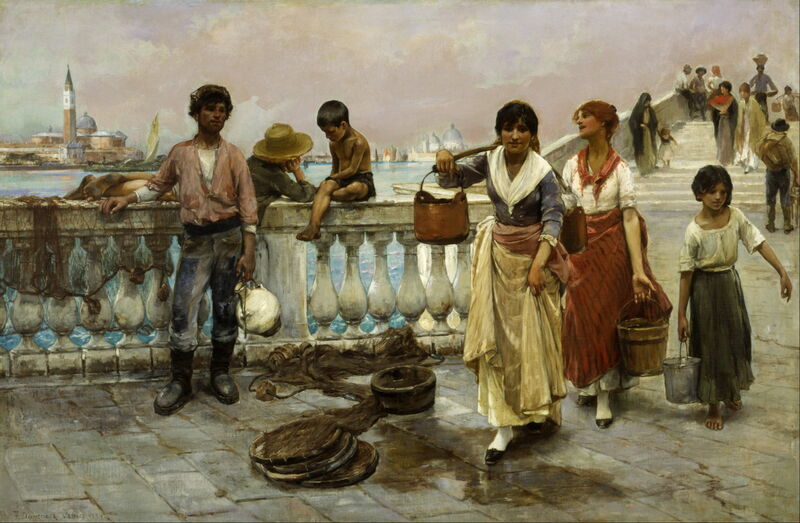 Water Carriers, Venice (1884) is probably Duveneck’s finest painting of Venice, combining the view from his earlier study, with an intimate insight into the daily work of ordinary Venetians. Frank Duveneck (1848–1919), Red Sail in the Harbor at Venice (c 1884), oil on canvas, dimensions not known, Cincinnati Art Museum, Cincinnati, OH. By Wmpearl, via Wikimedia Commons. 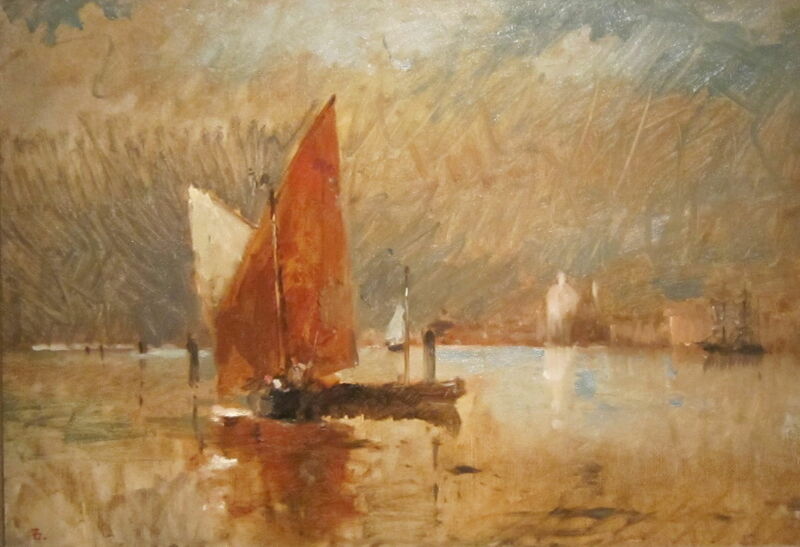 Some of his sketches from Venice are very progressive in their appearance, as with the vigorous brushwork of his Red Sail in the Harbor at Venice (c 1884). Frank Duveneck (1848–1919), Girl with Rake (c 1884), oil on canvas, dimensions not known, Private collection. Wikimedia Commons. 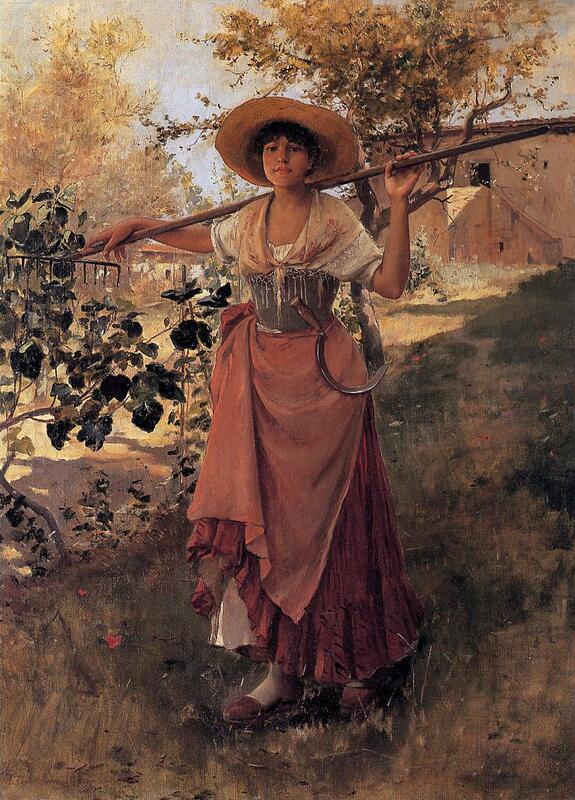 Duveneck painted some masterly works showing country people in their working lives: his Girl with Rake (c 1884) mixes precision in the foreground with varying degrees of looseness behind. Frank Duveneck (1848–1919), Siesta (1886), oil on canvas, dimensions not known, Cincinnati Art Museum, Cincinnati, OH. By Wmpearl, via Wikimedia Commons. 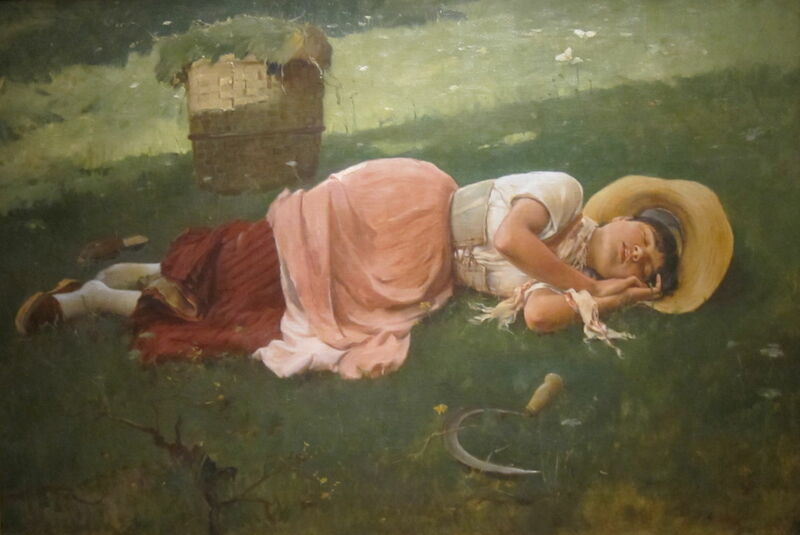 Despite being dated two years later, the young woman in his Siesta (1886) looks and dresses suspiciously similarly to that in Girl with Rake, down to her sickle, cast aside from her sleeping body. 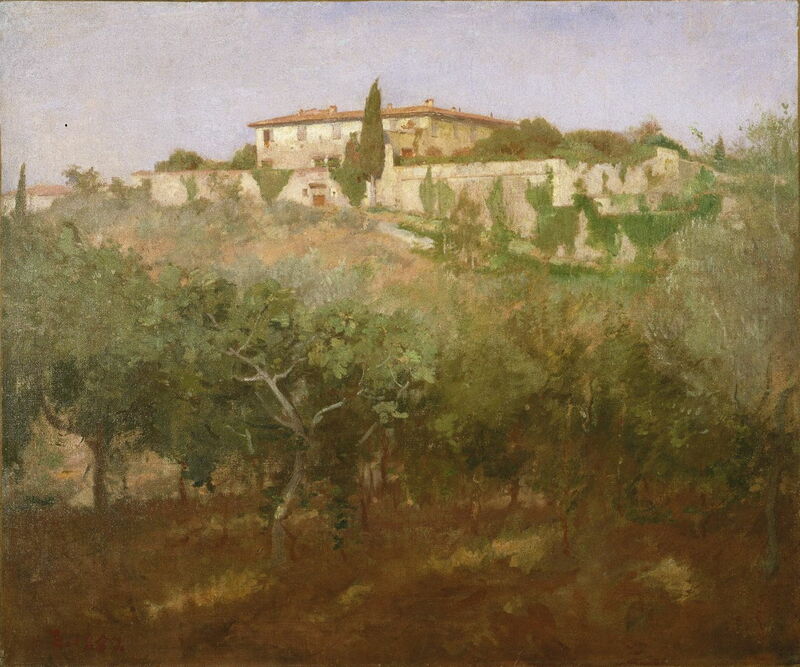 Frank Duveneck (1848–1919), Villa Castellani (c 1887), oil on canvas, 63.4 × 76.2 cm, Brooklyn Museum, New York, NY. Wikimedia Commons. Duveneck had already met and taught the American Elizabeth Boott in Paris, when he made his way to Florence. Boott had been born in Boston but raised in the Villa Castellani (c 1887) there. This villa overlooks the square of Bellosguardo, which in turn overlooks Florence, and has achieved literary fame in two of Henry James’ novels, Portrait of a Lady in which it is Gilbert Osmond’s residence, and The Golden Bowl in which Adam and Maggie Verver were modelled on Elizabeth Boott and her father Francis, a classical composer. 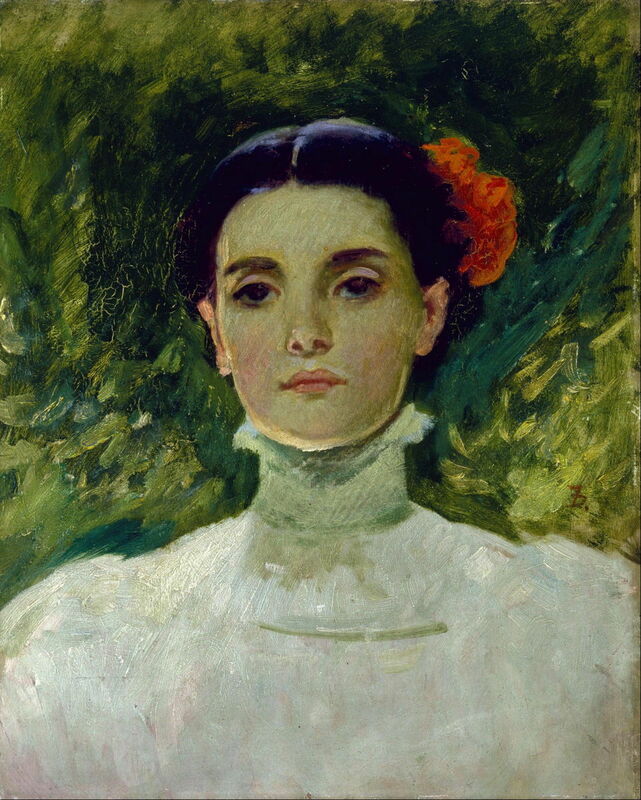 Duveneck married Elizabeth Boott in 1886, but she tragically died just two years later from pneumonia. Duveneck returned to the US to live in Covington and teach at the Art Academy of Cincinnati until his death. Among his pupils there was Edward Charles Volkert, the cattle painter. Frank Duveneck (1848–1919), Portrait of Maggie Wilson (1898), oil on cardboard, 38.1 × 30.5 cm, Museum of Fine Arts, Houston, TX. Wikimedia Commons. Among his portraits of this period is that of Maggie Wilson (1898). 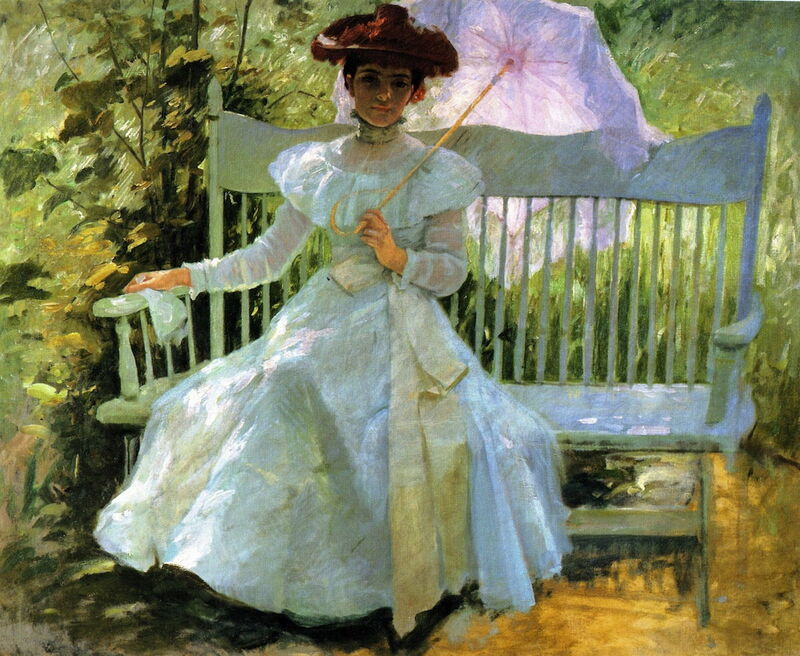 Frank Duveneck (1848–1919), That Summer Afternoon in My Garden (c 1900), oil on canvas, 93 x 113 cm, Private collection. The Athenaeum. He also painted some overtly Impressionist works, such as the brilliantly-lit That Summer Afternoon in My Garden (c 1900). 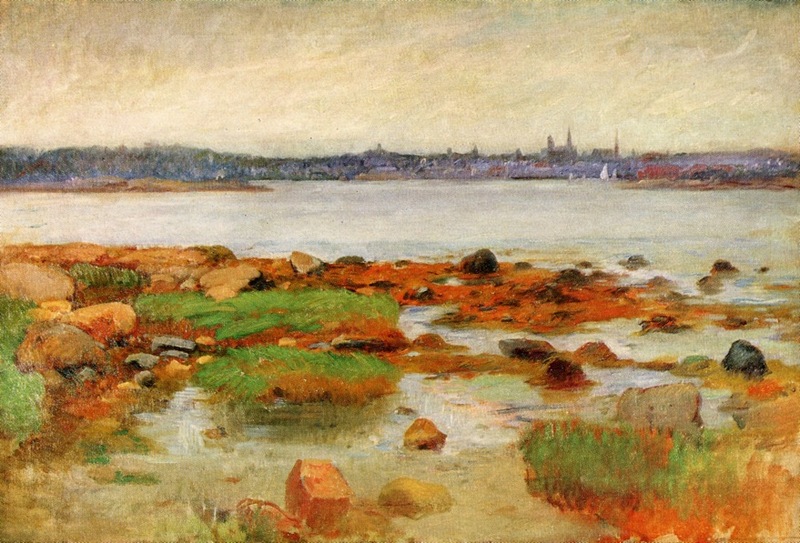 Frank Duveneck (1848–1919), Horizon at Gloucester (c 1905), oil on canvas, 61 × 91.4 cm, Cape Ann Museum, Gloucester, MA. Wikimedia Commons. 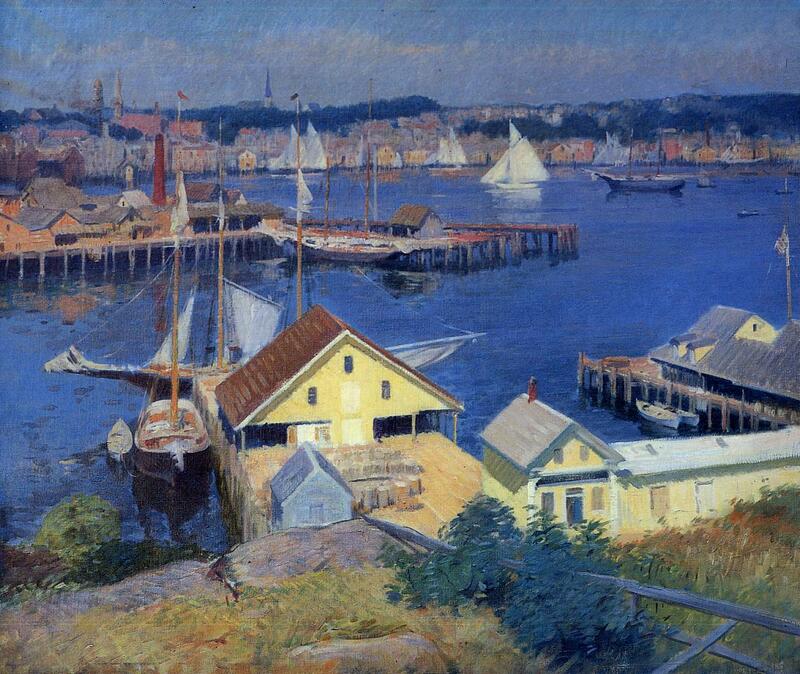 He spent his summers in and around Gloucester, Massachusetts, where he painted his Horizon at Gloucester (c 1905), which shows the port’s distinctive skyline from Eastern Point. In 1906, he was elected to the National Academy of Design as a full Academician. Frank Duveneck (1848–1919), The Yellow Pier Shed (c 1910), oil on canvas, 30 x 36 cm, Private collection. The Athenaeum. The Yellow Pier Shed (c 1910) is another of his summer paintings of Gloucester’s harbour. 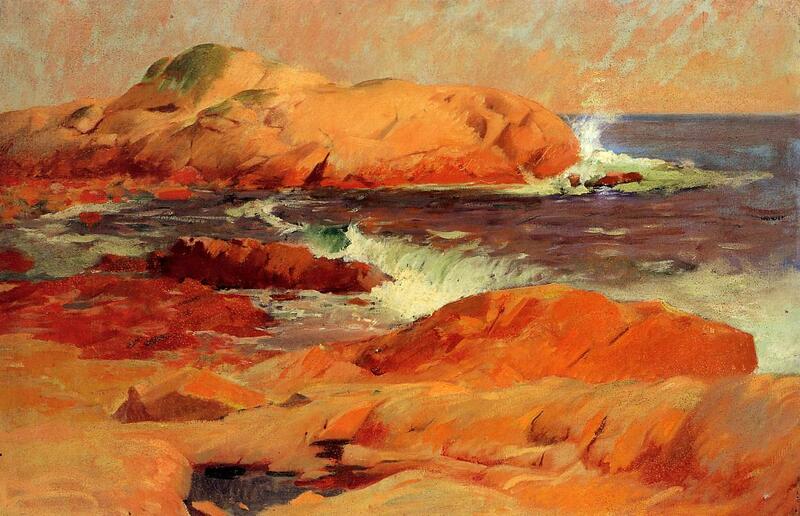 Curiously, in his final years he painted several views of Brace’s Rock (c 1916), off Eastern Point, Gloucester. Fitz Henry Lane (1804-1865) had done the same shortly before his death. Posted in General, Painting and tagged Boott, Chase, Duveneck, Impressionism, James, painting, Twachtman, Volkert. Bookmark the permalink.